I was in Santa Fe for a couple of weeks. When I went out for my morning run, I followed a paved pathway along the “river” (a parched, sandy channel, even in the monsoon season). I found my way back to town on another path, the Acequia Madre Trail, which follows the course of what I took to be a small creek (also dry). Later I learned that the Acequia Madre is not a creek but an irrigation ditch. Indeed, the name means “mother ditch”: It is the primary artery of an irrigation network built 400 years ago when the Spanish first came to this valley. The Acequia Madre de Santa Fe. Pronounced “ah-SAY-keyah.” As my wife Ros explains: The stress is always on the next-to-last syllable, but in this case the last syllable has two syllables. I learned more about acequias from Stanley Crawford, who grows various kinds of alliums and writes various kinds of books on a small farm northeast of Santa Fe, halfway to Taos. I met Stanley and his wife Rose Mary at the Santa Fe farmer’s market when I stopped to photograph a heap of their immaculate onions—as hefty, round and polished as bocce balls. I left their booth carrying away a couple of Stanley’s books. One is a novel, which I remember seeing but not reading in its original 1972 edition: Log of the S.S. The Mrs. Unguentine. The other book, which I began reading on the flight home to Boston, is Mayordomo: Chronicle of an Acequia in Northern New Mexico. Pitchfork in hand, I walk up the winding channel to meet the descending water. By the time it gets here the flow will be pushing a large roll of debris, and I will walk it back down through my place and into the next if need be, to fork out as much as I can…. All is quiet. This is a strange wait, as if for a train on tracks that curve out of sight behind a hill…. I am about to walk a little further up when a brown and grey tongue slips into view around a bend and rolls toward me, its dry leaves hissing softly, twigs snapping, approaching like some creature, a giant snake that has assumed a somewhat disorderly disguise. For the rest of the season, gravity does most of the work, but there are floods and droughts to cope with, plus muskrats and beavers, leaks and plugged channels. Most of all there are the landowners to cope with, for the acequia is not only a technological artifact; it is a social and political and cultural institution as well. The affairs of the ditch are governed by a three-member commission, elected by all the parciantes; the commissioners in turn appoint the mayordomo. The mayordomo is responsible not just for keeping the water flowing but also for equitably distributing it among the parciantes. And what is equitable? At the Acequia de la Jara a fair share is not to be defined by statute or contract but rather by history, by unwritten customs and habits, and by ongoing face-to-face negotiations. The process is not friction-free, but it seems to work. 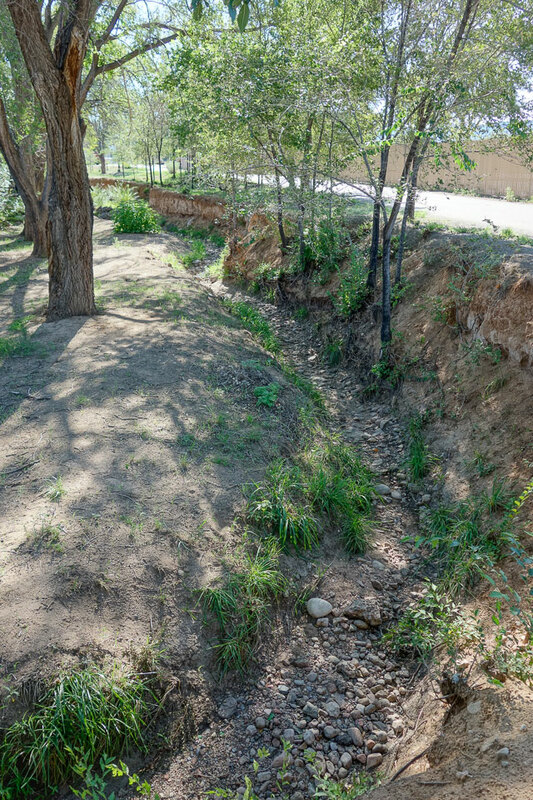 The water in an irrigation ditch is a shared resource, like the unfenced common pastures that so famously became so tragic in early-modern England. In fact, the irrigation ditch is even more vulnerable to selfish exploitation than a pasture that’s equally available to all: Those on the upper reaches of the ditch have it within their power to divert all the flow into their own fields, depriving those below. Yet they choose not to do so. What explains their forbearance? At a zanja near Heber, CA, on the Mexican border, headgates regulate flow into farmers’ fields. 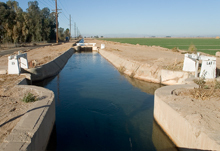 Some years ago I spent a few days exploring the irrigation works of the Imperial Valley in southern California, another place where water is distributed through public ditches—though out there they call the ditches zanjas rather than acequias, and the ditch boss is not a mayordomo but a zanjero. The Imperial Valley is a site of intensive, industrialized, large-scale agriculture; the growers have big bucks at stake. And water is the limiting resource: Every drop must be allocated and accounted for. The headgate controlling flow into each field is opened and closed on a precise schedule. Padlocks on the gates discourage cheating. In this social setting, the zanjero becomes a referee and an enforcer—an agent of a higher power. The rules of the game are rigidly legalistic. The continuing success of this small-scale self-organizing system—which has apparently been flourishing in the back country of New Mexico for hundreds of years—gives me hope for the future of democracy. The community’s problem-solving ability is especially impressive given the recent ethnic diversification, as long-tenured Hispanics have had to absorb an influx of undocumented Anglos, with concomitant differences along dimensions of language, religion, wealth, and education. A whole school of history associates irrigated agriculture with totalitarian governments. The underlying notion is that organizing the labor to tame a river requires a large-scale bureaucracy and a top-down power structure, often imposing slavery or peonage on part of the population. The historian Karl Wittfogel wrote of “oriental despotism” in the irrigation-based civilizations of Mesopotamia, Egypt and the Indus valley; according to his “hydraulic theory of the state,” irrigation and repression are causally linked. The early history of the acequias in northern New Mexico may well have followed the same pattern; it would be surprising if the Spanish conquistadors and missionaries did not rely on the forced labor of the indigenous Pueblo communities to dig the first ditches. 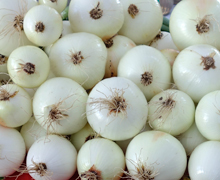 Nevertheless, the little band of farmers (and writers) along the Acequia de la Jara has made something more cheering from this dark legacy: a social collaboration that appears to meet their own needs, along with some beautiful onions and garlic. This entry was posted in off-topic, social science, technology. I can tell you what explains it in England, and still does so where there is still common land: the law. Contrary to popular belief, English common land was not anybody’s to use just as they wished. There were stringent local rules about the number and kind of “commonable beasts” that could be pastured on it, and anyone who ran too many animals, or destroyed water holes, or damaged the grazing area committed “waste”, an offense for which he could be fined or otherwise punished in the local court, and sometimes in the king’s court as well. Furthermore, it was not only the lord of the land who could bring suit, but any “commoner” (in the literal sense of one who had rights to use the common land). Common rights were individual rights and protected by individual legal sanctions against wrongdoers. No, the true tragedy of the commons was not its entirely mythical openness to destruction by overuse (even Hardin said later that he should have called his article “The tragedy of the unmanaged commons”). It was the expropriation, often by force, always without compensation, of the property rights of commoners in the 18th Century, and the consequent collapse of rural society that led to the great emigrations. As Cosma Shalizi points out politely on Pinboard, you really need to be taking a look at (former Santa Fe board member) Lin Ostrom’s work on common pool resources. “Governing the Commons” is the key book, but there’s tons more published by the Workshop on Political Theory at Indiana U (with everything on irrigation schemes you could ever want to know and more). Conveniently, Tim Harford ran a useful summary piece on the Ostrom-Hardin debate in the Financial Times a few days ago.